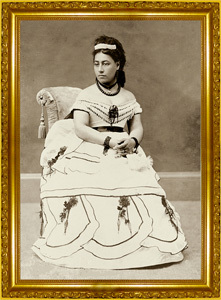 Emma was born on January 2, 1836 in Honolulu and was often called Emalani (“royal Emma”). Her father was High Chief George Naʻea and her mother was High Chiefess Fanny Kekelaokalani Young. She was adopted under the Hawaiian tradition of hānai by her childless maternal aunt, chiefess Grace Kamaʻikuʻi Young Rooke, and her husband, Dr. Thomas C.B. Rooke. Emma’s father Naʻea was the son of High Chief Kamaunu and High Chiefess Kukaeleiki. Kukaeleiki was daughter of Kalauawa, a Kaua’i noble, and she was a cousin of Queen Keōpūolani, the most sacred wife of Kamehameha I. Among Naʻea’s more notable ancestors were Kalanawaʻa, a high chief of Oʻahu, and High Chiefess Kuaenaokalani, who held the sacred kapu rank of Kekapupoʻohoʻolewaikala (so sacred that she could not be exposed to the sun except at dawn). On her mother’s side, Emma was the granddaughter of John Young, Kamehameha I’s British-born military advisor known as High Chief Olohana, and Princess Kaʻōanaʻeha Kuamoʻo. Her maternal grandmother, Kaʻōanaʻeha, was generally called the niece of Kamehameha I. Chiefess Kaʻōanaʻeha’s father is disputed; some say she was the daughter of Prince Keliʻimaika’I, the only full brother of Kamehameha; others state Kaʻōanaʻeha’s father was High Chief Kalaipaihala. This confusion is due to the fact that High Chiefess Kalikoʻokalani, the mother of Kaʻōanaʻeha, married both to Keliʻimaikaʻi and to Kalaipaihala. Through High Chief Kalaipaihala, she could be descended from Kalaniʻopuʻu, King of Hawaii before Kīwalaʻō and Kamehameha. King Kalākaua and Queen Liliʻuokalani criticized Queen Emma’s claim of descent from Kamehameha’s brother, supporting the latter theory of descent. Liliʻuokalani claimed that Keliʻimaikaʻi had no children, and that Kiilaweau, Keliʻimaikaʻi’s first wife, was a man. This was to strengthen their claim to the throne, since their great-grandfather was Kamehameha I’s first cousin. But even through the second theory Queen Emma would still have been descendant of Kamehameha I’s first cousin since Kalaniʻopuʻu was the uncle of Kamehameha I. It can be noted that one historian of the time, Samuel Kamakau, supported Queen Emma’s descent from Keliʻimaikaʻi and the genealogy stated by Liliuokalani have been contested in her own lifetime. Emma grew up at her foster parents’ English mansion, the Rooke House, in Honolulu. Emma was educated at the Royal School, which was established by American missionaries. Other Hawaiian royals attending the school included Emma’s half-sister Mary Paʻaʻāina. Like her classmates Bernice Pauahi Bishop, David Kalākaua and Lydia Liliʻuokalani, Emma was cross-cultural — both Hawaiian and Euro-American in her habits. But she often found herself at odds with her peers. Unlike many of them, she was neither romantic nor prone to hyperbole. When the school closed, Dr. Rooke hired an English governess, Sarah Rhodes von Pfister, to tutor the young Emma. He also encouraged reading from his extensive library. As a writer, he influenced Emma’s interest in reading and books. By the time she was 20, she was an accomplished young woman. She was 5′ 2″ and slender, with large black eyes. Her musical talents as a vocalist, pianist and dancer were well known. She was also a skilled equestrian. Emma became engaged to the king of Hawaii, Alexander Liholiho. At the engagement party, a Hawaiian charged that Emma’s Caucasian blood made her unfit to be the Hawaiian queen and her lineage was not suitable enough to be Alexander Liholiho’s bride; she broke into tears and the king was infuriated. On June 19, 1856, she married Alexander Liholiho, who a year earlier had assumed the throne as Kamehameha IV. He was also fluent in both Hawaiian and English. Each nation and even the Chinese hosted balls and celebrations in honor of the newlyweds. Two years later on May 20, 1858 Emma gave birth to a son, Prince Albert Edward Kamehameha. The queen tended palace affairs, including the expansion of the palace library. She was known for her humanitarian efforts. Inspired by her adoptive father’s work, she encouraged her husband to establish a public hospital to help the Native Hawaiians who were in decline due to foreign-borne diseases like smallpox. In 1859, Emma established Queen’s Hospital and visited patients there almost daily whenever she was in residence in Honolulu. It is now called the Queen’s Medical Center. Prince Albert, who was always called “Baby” by Emma, had been celebrated for days at his birth and every public appearance. Mary Allen, wife of the Chief Justice of the Supreme Court Elisha Hunt Allen, had a son Frederick about the same age, and they became playmates. In 1862, Queen Victoria agreed to become godmother by proxy, and sent an elaborate silver christening cup. Before the cup could arrive, the prince fell ill in August and condition worsened. The Prince died on August 27, 1862. Her husband died a year later, and Emma would not have any more children. After her son’s death and before her husband’s death, she was referred to as “Kaleleokalani”, or “flight of the heavenly one”. After her husband also died, it was changed into the plural form as “Kaleleonālani”, or the “flight of the heavenly ones”. She was baptized into the Anglican faith on October 21, 1862 as “Emma Alexandrina Francis Agnes Lowder Byde Rooke Young Kaleleokalani. Queen Emma was also nicknamed “Wahine Holo Lio” in deference to her renowned horsemanship. In 1860, Queen Emma and King Kamehameha IV petitioned the Church of England to help establish the Church of Hawaii. Upon the arrival of Anglican bishop Thomas Nettleship Staley and two priests, they both were baptized on October 21, 1862 and confirmed in November 1862. With her husband, she championed the Anglican (Episcopal) church in Hawaii and founded St. Andrew’s Cathedral, raising funds for the building. In 1867 she founded Saint Andrew’s Priory School for Girls. She also laid the groundwork for an Episcopal secondary school for boys originally named for Saint Alban, and later ʻIolani School in honor of her husband. Emma and King Kamehameha IV are honored with a feast day of November 28 on the liturgical calendar of the U.S. Episcopal Church. After the death of King Lunalilo, Emma decided to run in the constitutionally-mandated royal election against future King Kalākaua. She claimed that Lunalilo had wanted her to succeed him, but died before a formal proclamation could be made. “Salutations to You—Whereas His Majesty Lunalilo departed this life at the hour of nine o’clock last night; and by his death the Throne of Hawaii is left vacant, and the nation is without a head or a guide. In this juncture it is proper that we should seek for a Sovereign and Leader, and doing so, follow the course prescribed by Article 22nd of the Constitution. My earnest desire is for the perpetuity of the Crown and the permanent independence of the government and people of Hawaii, on the basis of the equity, liberty, prosperity, progress and protection of the whole people. It will be remembered that at the time of the election of the late lamented Sovereign, I put forward my own claim to the Throne of our beloved country, on Constitutional grounds — and it is upon those grounds only that I now prefer my claims, and call upon you to listen to my call, and request you to instruct your Representatives to consider, and weigh well, and to regard your choice to elect me, the oldest member of a family high in rank in the country. Iolani Palace, Feb. 4, 1874. Her supporters styled themselves as Emmaites or Queenites and were made up of mostly Hawaiians and British subjects of Hawaii. Emma’s candidacy was agreeable to many Native Hawaiians, not only because her husband was a member of the Kamehameha Dynasty, but she was also closer in descent to Hawaii’s first king, Kamehameha The Great, than her opponent. On foreign policy, she (like her husband) were pro-British while Kalākaua, although being pro-Hawaiian and somewhat pro-British, was more leaning toward the American. She also strongly wished to stop Hawaii’s dependence on American industry and to give the Native Hawaiians a more powerful voice in government. 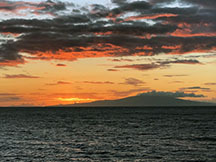 While the people supported Emma, the Legislative Assembly, which actually elected the new monarch, favored Kalākaua, who won the election 39 – 6. News of her defeat caused a large-scale riot in which thirteen legislators supporting Kalākaua were injured; one, J. W. Lonoaea, ultimately died of his injuries. The riot was eventually dispersed due to the assistance of both British and American troops stationed on warships in Honolulu Harbor. After the election, she retired from public life. While she would come to recognize Kalākaua as the rightful king, she would never speak with his wife Queen Kapiʻolani. The laying of the foundation of Lunalilo Home. Emma would never attend any event with either Liliʻuokalani or Kapiʻolani. This was because Emma had blamed the death of Albert on Queen Kapiʻolani, who was supposed to be the child’s governess. On her way back, she had a reception given for her on August 14, 1866 by Andrew Johnson at the White House. Some note this as the first time anyone with the title “Queen” had had an official visit to the U.S. presidential residence. In 1883, Emma suffered the first of several small strokes and died two years later on April 25, 1885 at the age of 49. At first she was laid in state at her house; but Alexander Cartwright and a few of his friends moved the casket to Kawaiahaʻo Church, saying her house was not large enough for the funeral. This was evidently not popular with those in charge of the church, since it was Congregational; Queen Emma had been a supporter of the Anglican Mission, and was an Episcopalian. Queen Liliʻuokalani said it “…showed no regard for the sacredness of the place”. However, for the funeral service, Bishop Alfred Willis of the English Church officiated in the Congregational church with his ritual. She was given a royal procession and was interred in the Royal Mausoleum of Hawaii known as Mauna ʻAla, next to her husband and son. The Queen Emma Foundation was set up to provide continuous lease income for the hospital. Its landholding in the division known as the Queen Emma Land Company include the International Marketplace and Waikiki Town Center buildings. Some of the 40 year leases expired in 2010. The area known as Fort Kamehameha in World War II, the site of several coastal artillery batteries, was the site of her former beach-front estate. After annexation it was acquired by the U.S. federal government in 1907. The Emalani festival, Eo e Emalani i Alakaʻi held in October on the island of Kaua’i in Koke’e State Park celebrates an 1871 visit.